I'm in love with trees. I've always been a nature girl, walking barefoot all summer - grass, gravel or sand - just to feel the connection with the earth. I love sitting at the beach or in a forest and letting nature sink into me. I've also always loved the tree motif. I have loads of tree art around my house - mostly stuff that I've created myself. 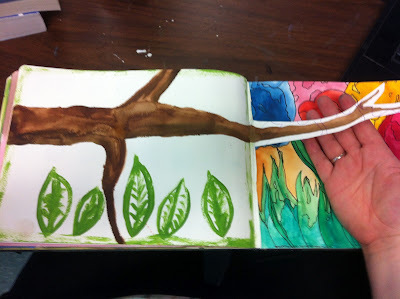 Today in my journal I'm making trees and leaves with watercolours. I love how the dark and light spots show so well with watercolour paints. 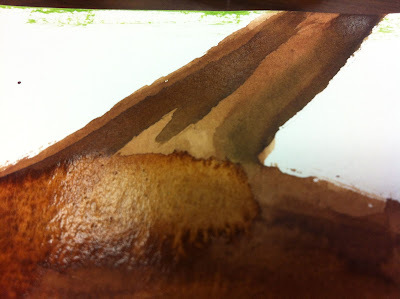 I decided to carry this branch across two pages and then to cut the right-hand page. Neat effect, right? Just me playing in my journal. No biggie. It is indeed a neat effect, a concept that I may have to steal for one of my journal entries. Consider yourself an inspiration. I've always been such a houseplant, and am working to embrace nature. It's not hard, either! I love your branch effect in your journal...clever!